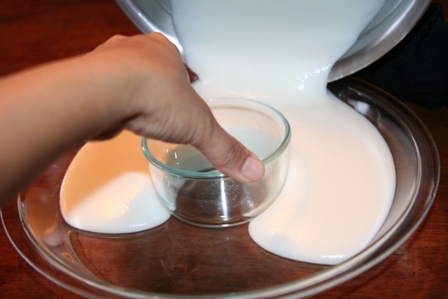 Put mochiko and sugar together in a mixing bowl. Mix. Add water.Â Mix thoroughly. 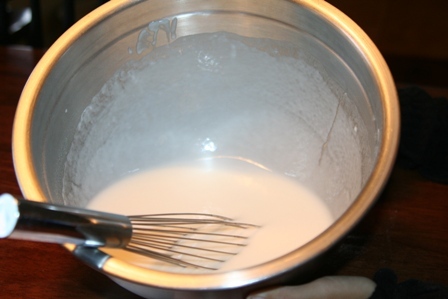 Spray PAM on dish (pyrex dish). Â Hold down cup in the middle while pouring. Put in microwave for 9 minutes. 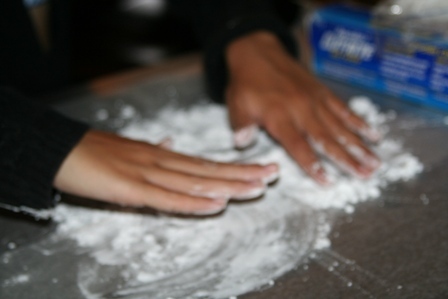 In the meantime, spread some potato starch on a wax paper. 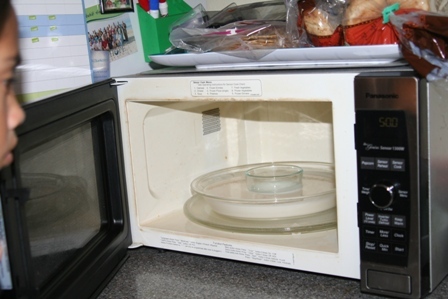 When 9 minutes is over, take the dish out of microwave. Cool off. Â Loosen the sides. Take the cup in the middle out first. Then cut in small rectangular shape. 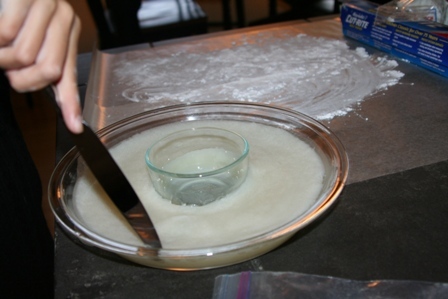 Roll the cut pieces in the potato starch. Enjoy! Now, this is the easy way and obviously the non-traditional way of making mochi. For a traditional way, check out this link. I’ve never even heard of it! Is it good? We are just so happy we can buy mochi ice cream here on the mainland. It’s a little taste of home, of the highest order! Ohhhhhhhhhhhhhhh YUM! 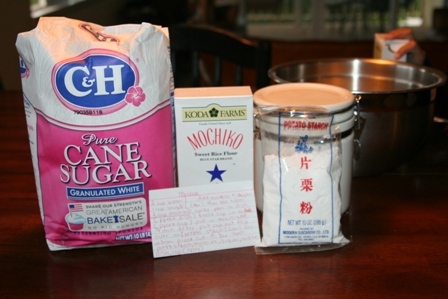 I’ve never known how to make mochi. I learned about it and learned to love it (wrapped around ice cream) years ago on a trip to Dallas and I am so happy to see this how-to so I can make my own! I’ve never heard of mochi! I googled it and it sounds quite good. Sometimes simple is good…gets the yummy to the tummy quicker:-)! .-= wes´s last blog ..2Day’s Word – Prepared And Ready =-.